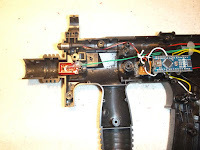 I built two cheap and cheeful MP5 'tag guns earlier this year and left them unlensed. 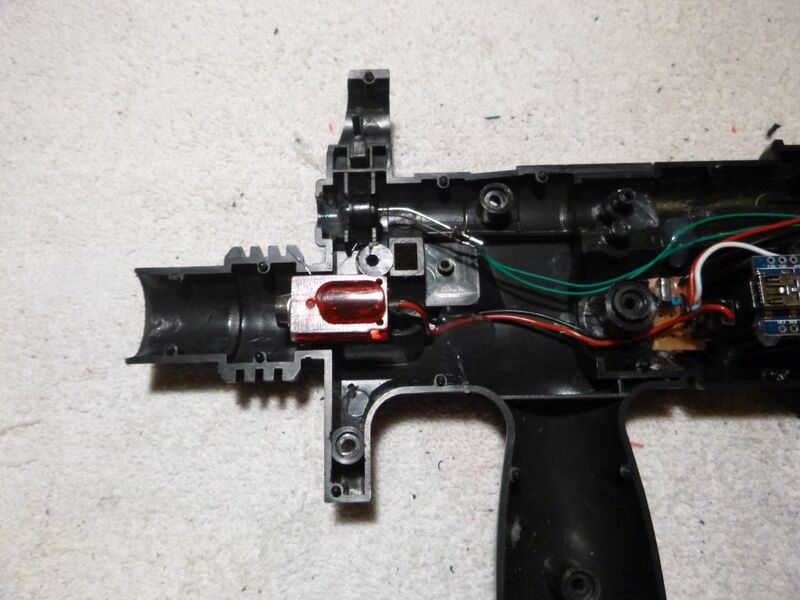 Having done the quickest, dirtiest thing I could when building I left the original muzzle flash bulb in place and stuck the emitter where they originally had cheapo laser pointers fitted. Sadly the range was predictably awful and they've not got much use as a result. This afternoon I opened them both up, swapped this round putting the emitter in the 'barrel' section and the muzzle flash where the emitter used to be. I also swapped the muzzle flash bulb for an LED. These gun bodies both came with faux suppressors that slide on the end of the barrel and now all I need to do is put a lens a suitable distance down these and it'll make for a basic lens unit. I'll probably leave it removable for easy transport.